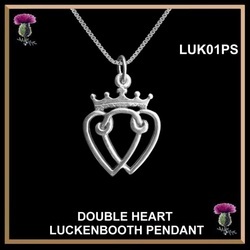 This exquisite small, double hearts Luckenbooth is solidly made in sterling silver. 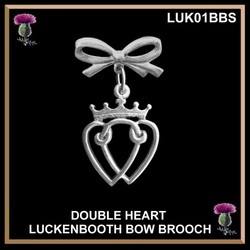 The Luckenbooth is one of the most romantic Scottish symbols of love, dating back to the 17th century and often given as a token of betrothal, affection and friendship. It is usually in the shape of a heart or two entwined hearts, symbolizing love, with a crown, symbolizing loyalty, topping the heart(s). In addition, a couple may pin a Luckenbooth to their firstborn’s blanket as a good luck charm. This is a gorgeous piece of Scottish jewellery and a unique one of a kind treasure!! This exquisite small, double hearts Luckenbooth is solidly made in sterling silver and comes with a high quality 18" box link chain. The pendant is 3/4" (20mm) wide and 1" (26mm) high. Our double hearts sterling silver Luckenbooth is suspended from a small sterling silver bow with a brooch pin back. The Luckenbooth is 3/4 “ (20mm) wide and 1” (26mm) high. The bow is 1" (26mm) wide and 1/2" (13mm) long. 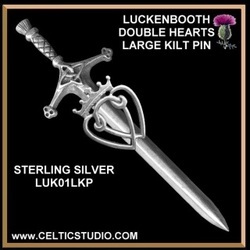 This sterling silver large Luckenbooth kilt pin is 3 7/8” (99mm) in length and is 1 5/16” (34mm) across the handle of the sword. The pin back is a one-part high quality nickel/silver bar pin for strength and security. 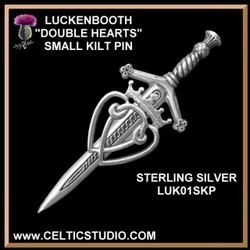 This sterling silver small Luckenbooth kilt pin is 2 3/4” (70mm) in length and is 1” (26mm) across the handle of the sword. The pin back is a one-part high quality nickel/silver bar pin for strength and security.